This is a screenshot of the community editions startup screen. In order to distinguish the different archaeological activities a distinct number range is of crucial importance. 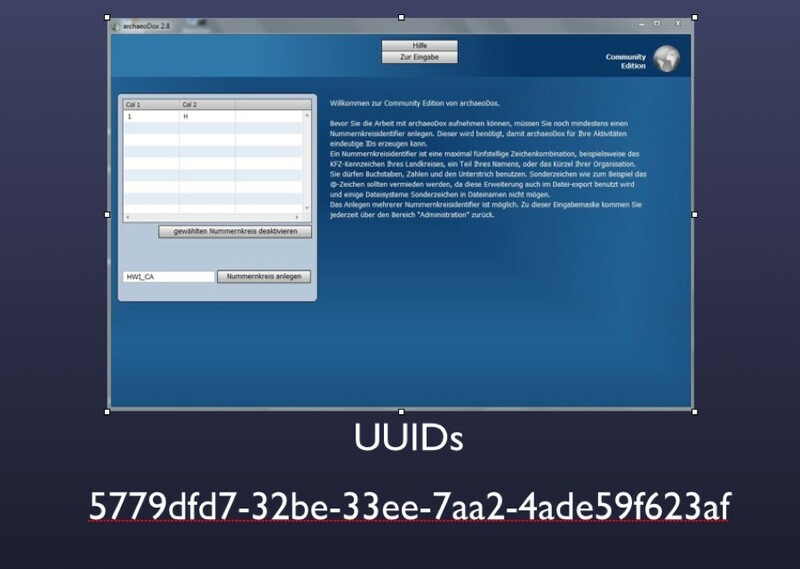 Even though on the surface Schleswig-Holstein and Hamburg are using the same numbering convention, an identifier of year and an ongoing campaign number, under the hood data integrity is always ensured through use of so-called UUIDs (universal unique identifier). The concept of using UUIDs is carried out through all database entities, thus every data-entry is always uniquely identifyable. Let’s take a look at starting a new activity. Additional to a mandatory setting of the geographical context, the official in charge needs to decide which module to use for collecting data. Both available modules are based on single- context-recording by Ed Harris. click The module „urban excavation“ is based on stratigraphic units and thus is the best fit for typical layer based excavations like in historic city centres or complex palaeolithic sites. click The other module „field excavation“ is based on the isolated feature, fitting for example for excavations on prehistoric rural settlements or burial grounds. The underlying data-structure is exactly identical and more and more gets closer to the CRM-datamodel. 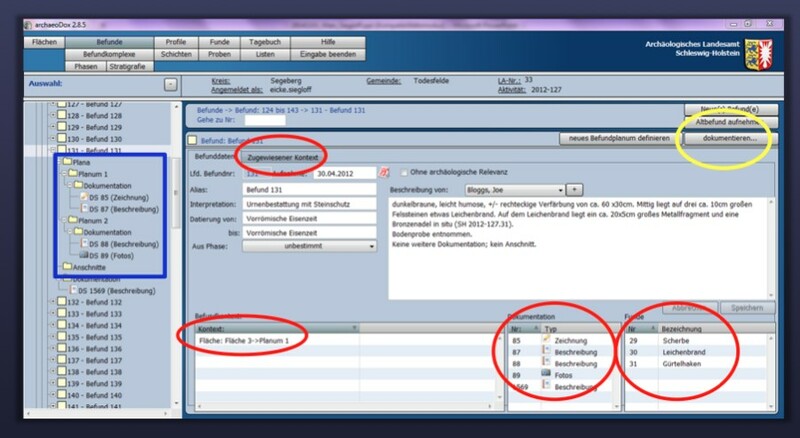 On the next screen – displaying the module field excavation in this case – we see the main data input screen. Three major components are displayed. There are a tree-view on the left hand side, list view and navigation in the center and on top a quick navigation using buttons. The buttons and nodes in the tree view correspond to existing technical units in an excavation, like for example so called areas. An area means nothing else than any section in an excavation. In this case eleven areas in the terrain have been entered and thus been recorded in archaeoDox. The same holds true for all other entities, such as features, as shown here. They can be recorded in batch processes to minimize input time. 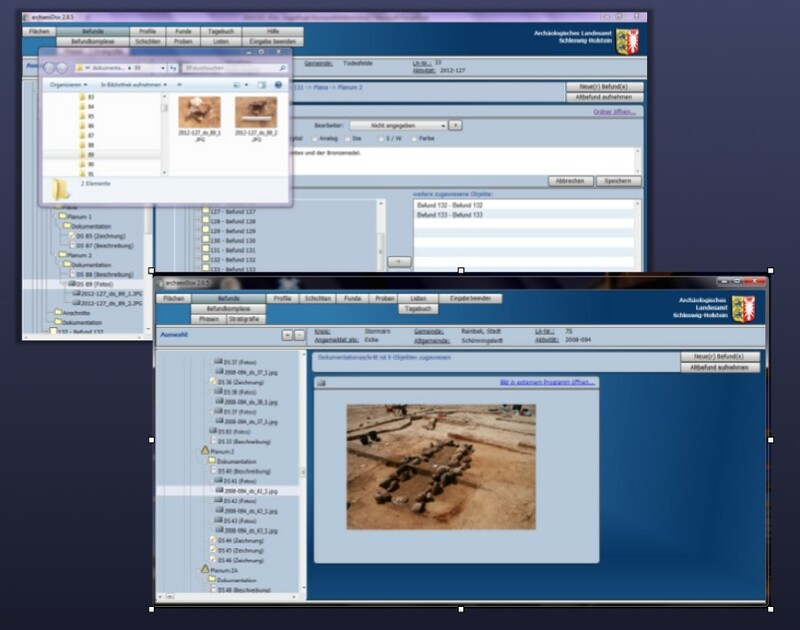 Displayed is the main view of a feature with various information, click such as the associated excavation area as the features context. Thesaurus driven fields are used for dating and feature naming. Features can generally be grouped into so-called feature- complexes, in example the grouping of several post-holes into a footprint of a building. Stratigraphic references such as „older than“ or „younger than“ can be entered using the stratigraphy-submodule. Looking at the tree-view one can see that the feature has been excavated in two plana. In the bottom right hand corner all related find objects are listed. The list fields always work as a quick navigation too, in this case in order to jump to the data of one of the related finds. The same holds true for all the related documentation steps. Using the example of this feature it becomes clear that it has been documented in five steps. archaeoDox increases a counter of documentation-steps for each activity. 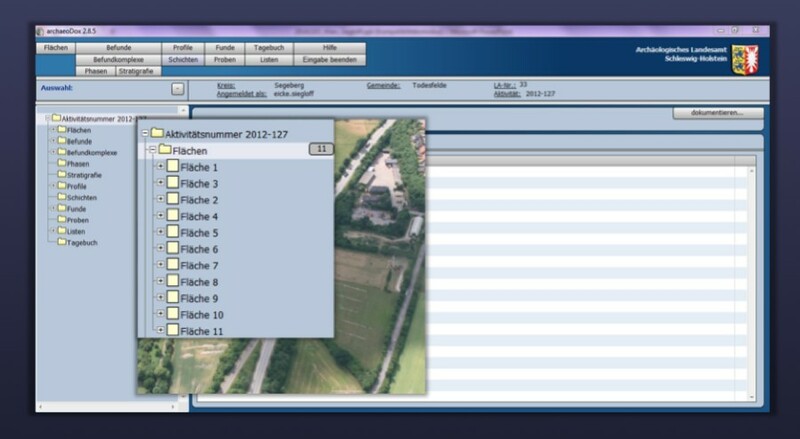 Verbal descriptions are shown directly in the main screen of the feature. Using this button the documentation can be completed any given time. When setting up a new documentation step a choice is given which type of documentation should be entered, like photos, measurements, drawings, etc. The core information, which context is being documented, is already given just by pressing the button. Now additional metadata can be entered. Due to archaeoDox also being a document management system governing hybrid filing systems, there are for example input fields for the pagenumbers of analogue drawings. Wherever possible and where it makes sense thesaurus driven fields are used. This extremely simple relationship hierarchy enables a simple context detached folder and file naming as we have seen before and particulary also multiple allocations, if for example a photo contains an overview of multiple features. 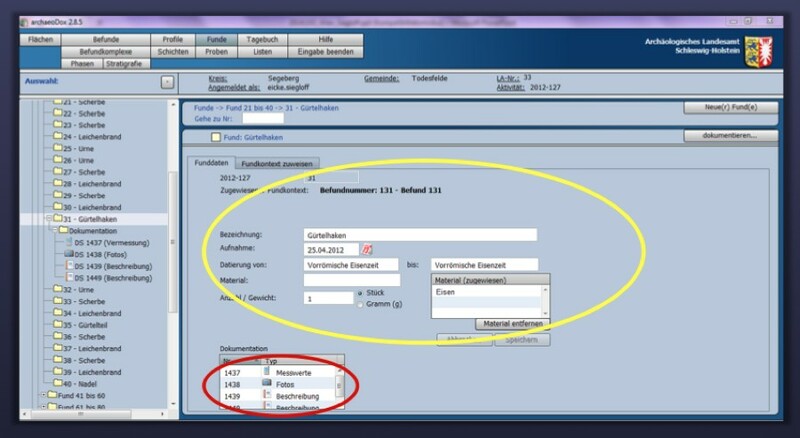 Each allocated feature will show the photo documentation step in its overview and redundancies are avoided. Simplifying the overview in the folders, optional tags can be defined. With the priority of keeping it simple the person in charge only needs to hit the link „open folder“ when creating the documentation step. In the background archaeoDox has automatically created the corresponding folder in the filing system. Just drag and drop the desired files into the folder – and done. 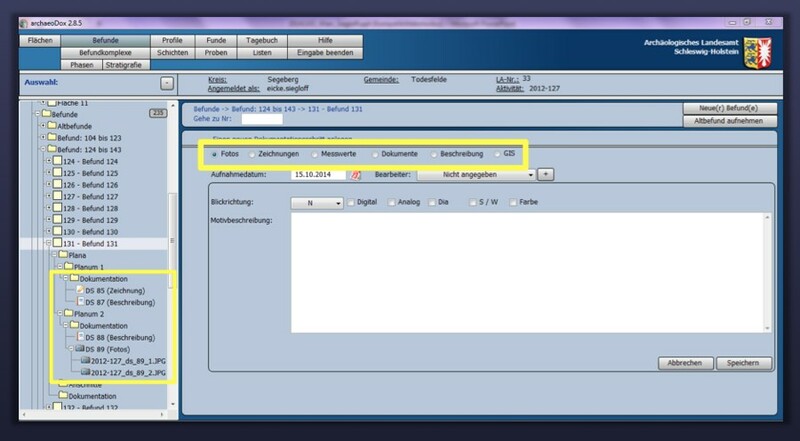 External files are shown up in the tree view and they have already been renamed by the system. For all documents of type picture a preview is implemented. Every other document can be viewed in the related viewing program just by clicking a link. For the entering of finds only object designation, material, dating, quantity and the find context are mandatory. Again, up to 50 finds can be entered at once in batch mode. Representing all types of entities, be they profiles, plana, samples, grids and so on you can also see here that even in this find a total of four documentation steps have been entered, among others a complementary description. Generally thesaurus driven vocabularies are used for the fields object designation, material and dating. 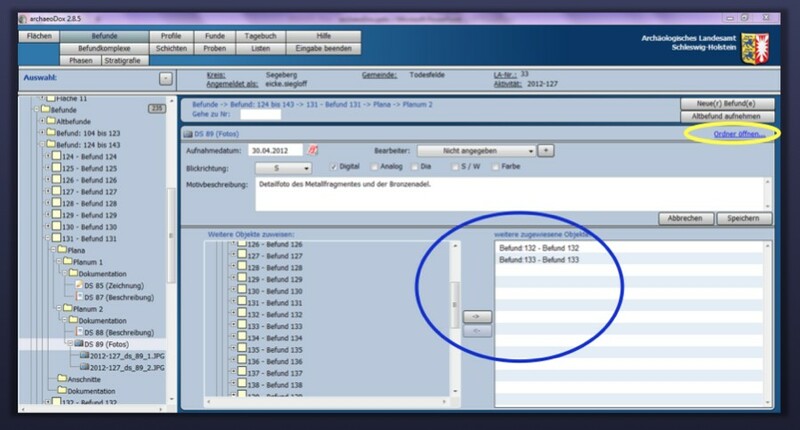 ArchaeoDox is capable of feeding a web-interface for data exchange to an external finds-database, in this case the Archaeological Database Schleswig-Holstein, using the standardized LIDO xml format. The user triggers this dataset-transmitting by pressing a button on the startup screen. The used vocabularies are maintained using a web based tool called xTree. It lets you use different kinds of synonyms for the same entry, also in other languages and with ISO-conform definitions and mappings to other vocabularies like AAT. So it does not matter which term is used in data entry or in search queries. Entries are grouped by topic in different hierarchy levels. Hamburg and Schleswig Holstein participate in building up a vocabulary for feature categories, in cooperation with the leading authority Landschaftsverband Rheinland. In all possible brevity we have shown you the main principles and concepts in archaeoDox, but could only barely scratch the surface. We are in a continuous process of refining functionality, both looking at usability and new features as you can see in this list. The depths of thinkable features and possibilities seem sheer endless. Currently search and reporting functions are being implemented or expanded. These analysis-tools seem to be developed relatively late, however, laying the foundation with homogenous datasets of high quality, it is crucial to go the first steps first. Particular mention should be made of a concrete planning of an extension to deal with geodata. Goal is to have a bi-directional interface to an Open source Desktop GIS system.